Who's Fault It Would Be If a Self-Driving Car Cause an Accident Fatal? In India, we see rapid adoption of advanced digital safety features causing significant industry disruption in the coming five years, even though we do not expect to see fully autonomous vehicles widely adopted any time soon. We see the EV share of total vehicle sales ramping up gradually as costs fall and charging infrastructure improves, but do not see this trend starting to shake up the industry until beyond 2030. Overall, we expect the path of travel to have a cumulative, rather than sudden, impact. As our Country is on the path of being completely electric or hybrid by 2030, what do you think will be the next step for the automotive industry? 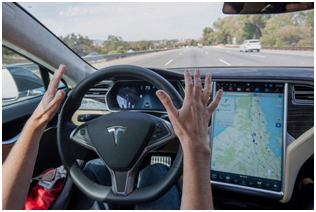 Yes, you are thinking right in near future we see the spread of advanced driver assistance systems (ADAS) potentially paving the way for the proliferation of self-driving vehicles. As much as it seems like a dream come true, with the countries currently using this technology, we can see self-driving cars causing few accidents fatal. So, in those cases who is to blame? The Driver? Manufacturer? Supplier? Robot Vehicle? Those could be the mistakes of pedestrians, as they might not have been aware of the vehicle approaching towards them. But the thing to worry about is that self-driving vehicle had no idea itself (as obviously sensors in the vehicle don’t read mind of people outside the car, it just read the gestures and body language of the person in the driving seat). Though the logic is pretty clear: if pedestrian is crossing then STOP, else GO..! Self-driving vehicle’s software do detect the pedestrian by applying the laws of physics, but there could be a situation where it would not have enough time to react e.g. if the pedestrian suddenly crossed the vehicle’s path. Stopping from 40 mph to 0 mph requires slamming the brakes, as we know an object in motion remains in motion until an opposite force like friction is applied to it. It would not be able to fully stop in time which would lead to hitting the pedestrian. During such cases, the video camera is there to record exactly whose fault it is, as according to rules driverless vehicles should have an “autonomous technology data recorder. So at a minimum that means the testing must capture data related to speed, steering, braking, and objects detected by sensors or video cameras. Multiple failbacks are installed to make sure that if one component of the system fails, another can take over. So, it's still not sure exactly who would be at fault, if such cases happen until and unless the video from the autonomous/self-driving vehicle comes out. But it's sure, if anytime self-driving vehicle involved will be found liable to the fatality, it will impact on new stricter regulations for self-driving vehicles. Till autonomous vehicles comes to India, let's drive safe with manual vehicles. If you are looking to acquire or dispose pre-owned vehicles and equipment, Shriram Automall India Limited(SAMIL) is the No.1 choice which will provide you with best of their services while making your experience both easy and comfortable.